The pale-purple coneflower is a native of North America where it is found on the dry prairies of the southern states from Alabama to Texas. It is also found in the sparse deciduous forests of the central and eastern states of the USA. Echinacin, essential oil, resins, bitter substances, phytosterols, inulin, polysaccharides and the bacteriostatic echinacoside. on sandbanks. In Europe the pale-purple coneflower is successfully cultivated on almost all garden soils. In the cold season echinacea plays an important role in the prevention and treatment of colds and flu-like infections. The nonspecific stimulation of the immune system supports and enhances the natural defenses giving the body greater power to ward off different types of pathogens such as viruses, bacteria and protozoa. Echinacea is often used internally to support the treatment of recurrent infections of the airways and the lower urinary tract. We owe our knowledge about the medicinal uses of echinacea largely to the North American Indians. It was one of their most important medicinal plants and was used traditionally to heal febrile illnesses, insect bites, poorly healing wounds and even snake bites. 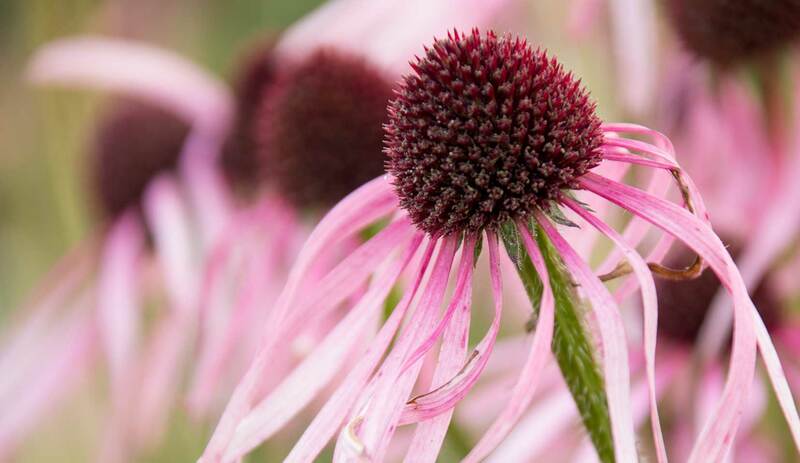 Originally echinacea was used particularly for the treatment of open wounds. It was effective in all inflammatory-febrile processes following injuries. The suitability of echincea for wound healing and for the treatment of skin diseases derives from its anti-inflammatory and antiseptic action and its reduction of swelling. Echinacea has practically no relevance for the preparation of teas as most of its constituents are lost on drying. The scientific name of the pale-purple coneflower comes from the Greek "echinos" = hedgehog, and appropriately describes the spiny appearance of the flowerhead. At the end of the 19th century, white settlers in North America discovered the importance of the pale-purple coneflower, which had long been used by the Indians as medicinal plant. The homeopath Dr. Meyer watched an Indian woman crush an echinacea plant between stones. She also showed him how he could treat wounds and injuries with the fresh plant pulp. Around 1870 he put the world's first echinacea preparation on the market in the mid-west of the USA under the name "Meyer's Blood Purifier". Initially he did not even know the name of the medicinal plant which was so successful in the treatment of numerous complaints. He later had it identified by Lloyd Brothers in Cincinnati, the largest suppliers of herbal drugs in North America at that time. At the end of the 19th and the beginning of the 20th century there was such a boom in the sale of echinacea that it became the most frequently sold herbal drug in the USA. stimulate greater activity of the forming, ordering, and gestalt-giving powers of the organism. For the production of essences, the entire echinacea flowering stems are harvested from the medicinal herb garden of WALA Heilmittel GmbH in July and the roots in the winter. Echinacea is contained in Dr.Hauschka Clarifying Toner and Dr.Hauschka Med Labimint Acute Lip Care.